The opening day of the Project Zone Congress included a full day track focused on Project Portfolio Management. The quality of the presentations made it one of the most interesting day’s I’ve spent in a very long time! The presentations linked the critical importance of a strategic PMO to effective portfolio management and PPP governance. The importance of ‘doing the right projects’ was highlighted by a presentation from SAP; 20% of the world’s business involves one organisation delivering a ‘project’ to another organisation, and then there is the increasing tendency for organisations to achieve growth and change by commissioning internal project. The first key message from the day was the vital importance of each organisation developing a realistic and achievable ‘strategic road map’, with specific milestones, that define how the organisations strategy will be achieved. Most organisations have a high level strategy, very few have a pragmatic plan for the next 1 to 2 years describing exactly what will be done towards achieving the overall strategy in that timeframe. Developing this practical implementation plan (still at a reasonably high level) is difficult work for the executives involved. However, once the plan is agreed it becomes the key tool for implementing effective portfolio management decision making to select the projects and programs that contribute most strategic value. Building this capability is a key governance issue! The next key message is that developing the ‘road map’ and then accepting portfolio investment decisions based on the ‘road map’ requires discipline and cannot occur without strong executive level support. Manager’s ‘pet projects’ are always an issue! One very useful idea was using the ‘road map’ and portfolio management to assess projects at the ‘idea’ stage – a standard one-page outline of the concept being proposed. If the concept fits into the ‘road map’ and looks feasible it is approved for developing a business case and planning, if it does not, it is rejected before much investment of time and effort has occurred. A much easier decision!! The process needs to be disciplined but not ridged – a degree of flexibility is essential to allow effective responses to market changes and regulatory changes. The concept of value was also discussed – projects need to be assessed on their contribution to achieving strategic objectives as well as financial factors. Value is far more than just dollars!! Probably the strongest message for me was the importance of concise information in modifying behaviours. An effective strategic PMO can have a huge effect on executive decision making simply by informing the executive of the ‘road map’ and of the effect any decision will have on the organisations overall journey towards its strategic objectives – good information really does lead to good decisions (and makes defending a ‘pet project’ very difficult – no one like to look too disruptive). The importance of the routine aspects of portfolio management were not ignored (see more on portfolio management), understanding capability and capacity, the effect of queuing theory slowing everything down if too much work is approved was discussed, and the importance of effective surveillance of projects in progress were all covered. 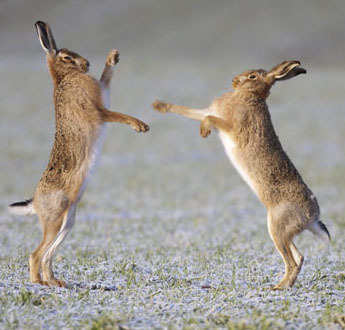 And my presentation on Portfolio governance and risk – its all about the stakeholders was well received. A key closing thought is do not underestimate the time and effort needed to change organisational culture to facilitate effective strategic planning at the ‘road map’ level linked to portfolio management and the creation of an effective strategic PMO. Most presenters had spent 3 to 5 years building the capability within their organisations and were still working on the executive ‘culture’ to achieve the outcomes they were describing. The good news is that it is worth the effort; the SAP presentation quoted data showing an increase in profit of between 2% and 5% of the organisations turnover associated with implementing effective portfolio governance. 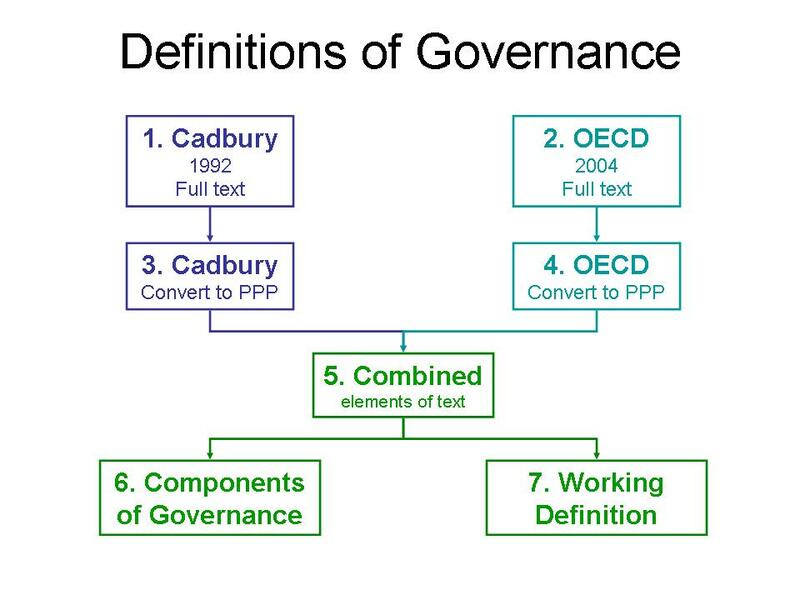 My last post looked at developing a grounded definition for the governance of PPP based on established definitions for corporate governance (see: Defining Governance – What the Words Mean) . This post looks at how the definition can be put into practice to govern an organisation doing projects and programs. An organisation is governed by its ‘governing body’ which, depending on the nature of the organisation, may be an individual, a small group, a committee or a formally constituted board of directors. Whilst this statement may seem obvious, it is vitally important! The governing bodies job is to represent the interests of the organisation’s owners and to appoint, direct and oversight the organisation’s management (see more on organisational governance). Within the organisation, the workers are appointed, directed and overseen by management, management is appointed, directed and overseen by the executive and the executive is appointed, directed and overseen by the governing body. However, whilst the governing body has responsibilities and obligations to both the organisation’s owners and other external stakeholders, within the organisation, the governing body is self-governing and very often self-appointing (in practical effect if not always in theory). And unlike management which is hierarchal, within most Boards the legal assumption, and general practice, is that all of the members are equal . Taking appropriate actions to support the needs of stakeholders and sustainability (CSR). The ‘governing body’ cannot achieve these responsibilities alone, management support is essential. 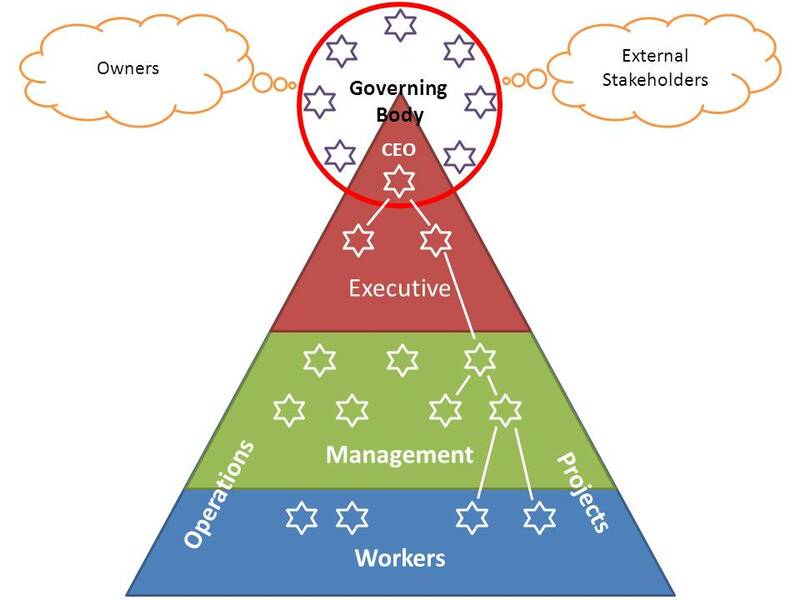 However whilst the governing body can and should delegate aspects of the organisation’s governance processes to management and should hold management accountable for their performance, the ‘governing body’ is ultimately responsible for the actions of the organisation it is governing, including the actions and failures of management. The Australian Institute of Company Directors (AICD) has developed a comprehensive Corporate Governance Framework to help directors understand their responsibilities and develop the skills they need to serve effectively on a ‘governing body’. The framework sums up the practices (skills, attributes and expertise) that comprise good director practice as demonstrated by responsible directors. It is designed as a wheel that has four quadrants depicting the four key areas of focus and engagement applying to every individual director: individual, board, organisational and stakeholder. Each quadrant is divided into a number of slices representing director practices essential to the quadrant’s focus (the different sizes of the slices do not represent the relative importance of the topic). Together with the AICD’s Guide for Directors and Boards: delivering good corporate governance, which articulates a set of values and principles that underpin the behaviours and practices of sound directorship, the framework provides a solid basis for developing the skills needed to ‘govern’ an organisation. Whilst the inclusion of stakeholders as one of the four focuses is something I strongly applaud, the governance of PPP is focused in the ‘green quadrant’ and really only connects directly into a couple of the sub-sectors, primarily, implementing the organisations strategy (3.3.1). Therefore, a different frame is needed to understand the governance of PPP in the overall context of governing an organisation. This reframing consolidates many of the personal responsibilities highlighted in the AICD framework whilst retaining the core tenet that governance is a holistic process and a significant failure within the PPP domain can have ramifications across the entire organisation. The ‘petal diagram’ below is our attempt to reframe the concepts of governance is it is affected by, and affects the PPP domain. The ‘petals’ seeks to aggregate the various functions of governing the organisation into the five main themes, whilst other aspects of governance such as the performance of the ‘governing body’ and of individual directors have been largely omitted for clarity. 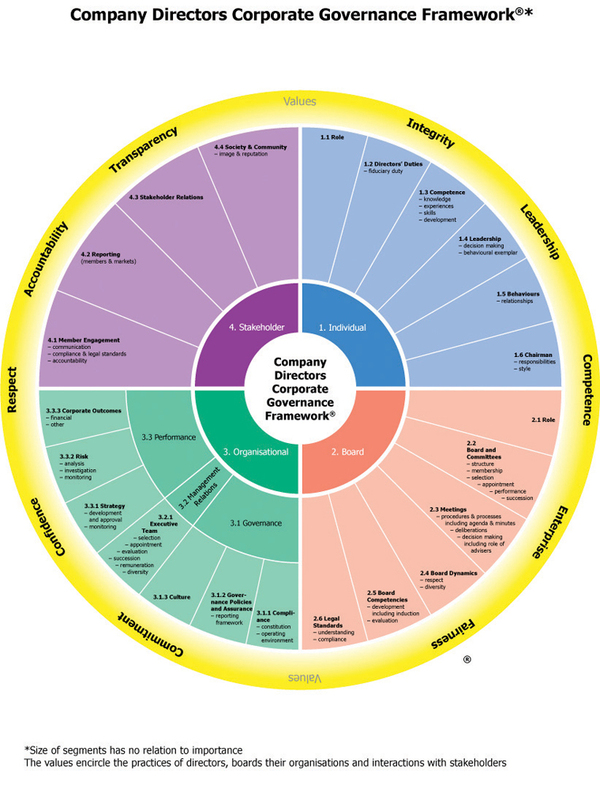 The importance of these ‘other’ functions from the AICD perspective of developing the competence of directors is crucially important; the ‘petal diagram’ assumes competent directors and an effectively functioning board and focuses on the board’s role in governing the organization. The domain of PPP is focused on implementing the changes needed to fulfil the organisation’s strategy and therefore, the processes of PPP are grouped in the ‘Governing Change petal’. The other ‘petals’ are aspects of governance and management that affect, or are affected by the change processes. This petal diagram is a synthesis of several sources focused on various aspects of governance that are associated with projects, programs and portfolios. The primary source is the AICD ‘Company Directors Corporate Governance Framework™’. discussed above. AS/NZS 8016: 2010 corporate governance of projects involving information technology investments (AS8016, 2010). From within this overall governance framework, the more specific aspects of governing PPP can be established (see more on governing PPP). Governance is a holistic process, and the ‘governing body’ has exclusive accountability and responsibility for the effectiveness of the organisation’s governance. Governance and management are quite different functions. The College of Scheduling (PMCOS) is a new, international, professional association. Incorporated in November 2013, its mission is to provide a forum for Professionals to promote excellence in planning and scheduling through networking, sharing project experiences, providing and receiving training, and providing support and encouragement for the ongoing development of a body of knowledge. Already operating on three continents, the College urges anyone who is passionate about our mission to be a part of this dynamic organisation. You will have an opportunity to put your own ideas into practice and potentially change the way scheduling is perceived in every industry around the world. For more information, visit http://www.pmcos.org. Its early days at the moment but hopefully the PMCOS will pick up from where the PMI College of Scheduling left off when it was converted into a ‘community of practice’ by PMI management and drive developments in scheduling theory to underpin the technology and practice of the profession. The Symposium’s location is Lecture Theatre South (Building 30) we have the foyer and the use of 3 lecture theatre’s LT1, LT4 and LT45. On-site parking is free, use car park 91 and walk down it will take about 5 minutes, the cadets are on leave so car parks are available. Download the UNSW / ADFA Map. At $820, the symposium represents fantastic value for a two day event. Can you afford to miss this outstanding line up? 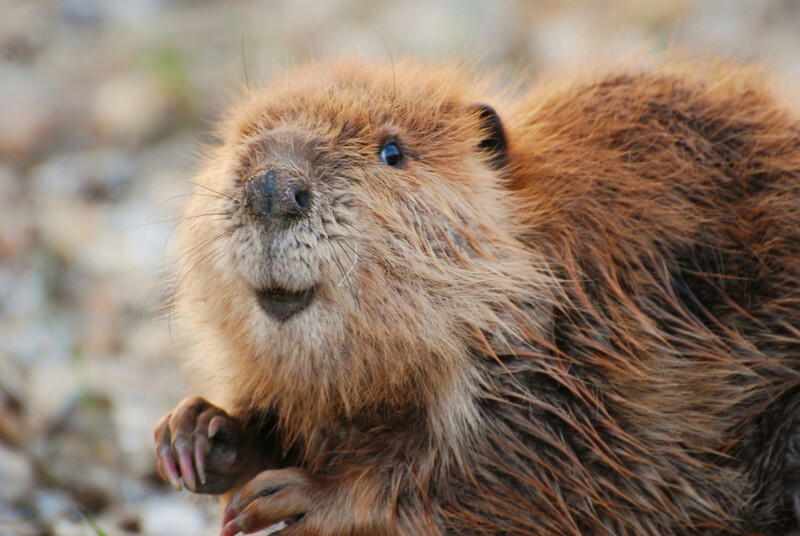 Governance is the act of governing. Originally the province of ‘rulers’ over the last century or so, as power and authority has devolved to various types of organisation, and the influence of organisations within society has grown, the concept of governance has become increasingly important to the people entrusted with leading these organisations and to the stakeholders who own or intact with the organisation, corporation or department. Governance is the controlling, directing or regulating influence. 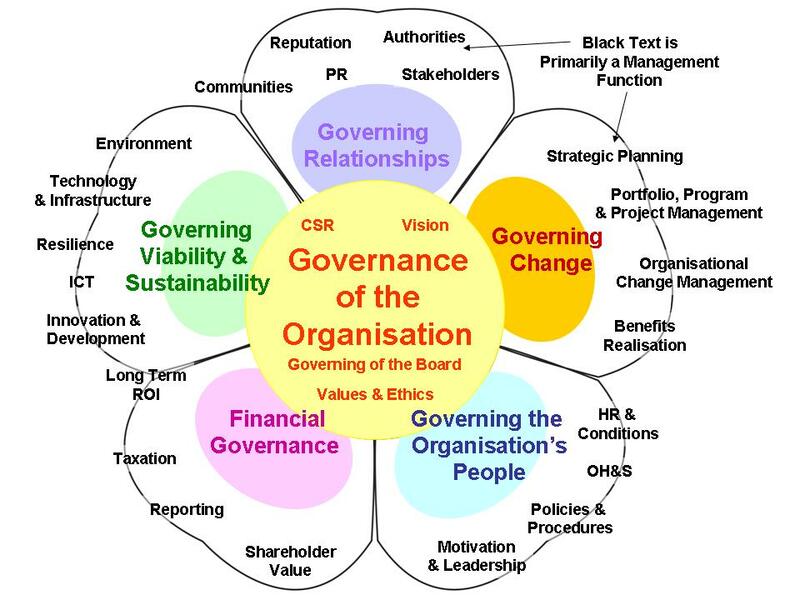 Therefore organisational governance can be defined as the system by which organisations are directed and controlled. It involves a set of relationships between an organisation’s management, its board, its shareholders and other stakeholders and provides the structure through which the objectives of the organisation are set, and the means of attaining those objectives and monitoring performance. Corporate governance is the system by which companies are directed and controlled. Boards of directors are responsible for the governance of their companies. The shareholders’ role in governance is to appoint the directors and the auditors and to satisfy themselves that an appropriate governance structure is in place. The responsibilities of the board include setting the company’s strategic aims, providing the leadership to put them into effect, supervising the management of the business and reporting to shareholders on their stewardship. Corporate governance involves a set of relationships between a company’s management, its board, its shareholders and other stakeholders. Corporate governance also provides the structure through which the objectives of the company are set, and the means of attaining those objectives and monitoring performance are determined. Good corporate governance should provide proper incentives for the board and management to pursue objectives that are in the interests of the company and its shareholders and should facilitate effective monitoring. PPP governance is the system by which an organisation directs and controls those aspects of its work that will be accomplished through the performance of projects or programs. Boards of directors (or their equivalent) are responsible for the governance of their organisation and for satisfying themselves that an appropriate PPP governance structure is in place. This includes understanding the organization’s strategic aims, providing the leadership to put them into effect, supervising the management of PPP and overseeing the stewardship of the resources used in PPP. PPP governance involves a set of relationships between an organization’s board (or its equivalent), its executive management, its PPP management and other stakeholders. PPP governance also provides the structure through which the objectives of the organisation are refined, and the means of attaining those objectives and monitoring performance. Good PPP governance should provide proper incentives for management to pursue objectives that are in the interests of the organisation and its owners and should facilitate effective monitoring. PPP governance is the system by which an organisation directs and controls those aspects of its work that will be accomplished through the performance of projects or programs. It involves a set of relationships between the organization’s board (or its equivalent), its executive management, its PPP management and other stakeholders. The board of directors (or their equivalent) are responsible for the governance of the organisation and for satisfying themselves that an appropriate PPP governance structure is in place. PPP governance provides the structure through which the strategic objectives of the organisation are refined and the means of attaining those objectives are implemented. PPP governance also includes understanding the organization’s strategic aims, providing the leadership to put them into effect, supervising the management of PPP, overseeing the stewardship of the resources used in PPP and monitoring performance. Good PPP governance should provide proper incentives for management to pursue objectives that are in the interests of the organisation and its owners and should facilitate effective monitoring. Creating the PPP management system including Portfolios / program / project management systems. Surveillance (PMOs etc., + accountability). Organisational support (HR, Finance, etc). Alignment with strategy to create value (primarily portfolio responsibility). Stewardship = the assignment and acceptance of responsibility for overseeing and protecting something considered worth caring for and preserving by shepherding and safeguarding the valuables of others (ie, the resources assigned by the organisation for use in PPP). PPP Governance is the creation and implementation of the framework and principles by which the organization’s PPP activities are directed, supported, monitored and controlled. Framework = P + P + P management structures (see more on PDC). Principles = stewardship, sustainability, stakeholders, etc. Direction = alignment with strategic objectives, etc. Support = organisational systems, HR, finance, etc. Monitoring = surveillance, PMOs, etc (see more on surveillance). Control = tie back to organisational objectives. Based on these definitions, in my next post the role of PPP Governance as a core component o organisational governance will be discussed. Our Mad March sale is finally over but our world-beating prices remain for 2014 with our guarantee to beat any comparable price by $50. Prices for our Mentored Email™ self-paced distance learning courses for PMI-SP, CAPM and PMP depend on your location and your selected options.